The sad news is that today, people tend to be getting less sleep or poor quality sleep than they had in the past and it is affecting their physical health. Both adults and kids alike should be getting a good night’s sleep. 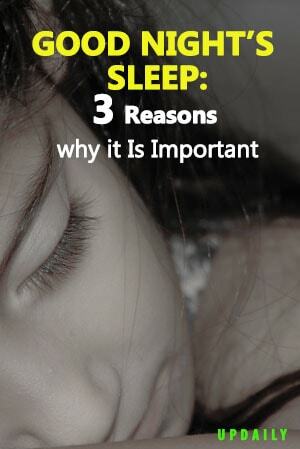 Here are some of the most important reasons why Good Night’s Sleep is important. 1. Poor sleep can make you obese. Don’t you know that one of the reasons why you are gaining weight fast is because of the fact that you are not getting enough slumber? Short sleep duration is one of the major factors of obesity because it alters hormonal levels that lead to overeating and hunger. So if you want to be fit and slim, it is crucial that you get good quality sleep. 2. A good rest can increase your concentration and productivity. Sleep is very important for your brain function. If you lack sleep, you will find it difficult to concentrate and think well. You will not be very productive, too, because you are sleepy. On the other hand, if you are not sleep deprived, your memory and problem-solving skills are enhanced and this is true for both children and adults. 3. A good sleep can improve athletic performance. If you are an athlete playing games or sports, you should also make sure that you get plenty of good sleep. It is not enough that you spend a lot of your time on your training and practice, but you need to allow your body to rest and get energized. Longer sleep was found to improve speed and accuracy in your sports, and it can even help you achieve a healthier mental wellbeing. Many people take sleep for granted these days because of the growing number of distractions but don’t allow yourself to be one of them. Poor sleep is linked to many chronic diseases and that’s not something you want to suffer from. So hit the sheets early and slip yourself into a good and deep slumber tonight.